The BNSF Alumni Association is a community for retirees of BNSF or its predecessor railroads. The BNSF Alumni Association will be hosting occasional gatherings for its members at locations around the network as well as inform members of the railroad’s latest trends and challenges. 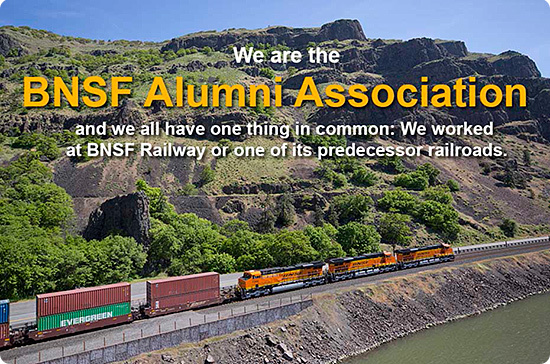 Visit the BNSF Alumni Association page to join. For years, you’ve had a one-track mind – meeting the needs of BNSF Railway customers and colleagues. Now that you’ve retired, it’s essential to keep what’s really important on the main track – your medical and retirement plans. Retirees from BNSF continue to be an important part of the company’s culture and history. If you are a current or retired BNSF employee hired on or before April 30, 1971, by a BNSF predecessor or legacy railroad, you may be eligible for Amtrak travel privileges. * The employee’s ‘home road’ is the railroad the employee worked for April 30, 1971, the date Amtrak began its service. Effective July 1, 2015, Amtrak will no longer provide pass privileges to non-public law freight railroad pass riders (those hired between May 1, 1971 and April 27, 1981). Their pass files in Amtrak’s reservation system will be inactivated on that date. In almost every case it is more advantageous for these pass holders to travel as a revenue passengers. The fare is lower and there is no 24-hour limitation, nor is there a restriction on the types of services that may be used. Pass privileges for public law freight railroad pass riders are unaffected, and they will continue to have the same pass privileges they have now. Call 817-352-4983 to request an application by mail. Complete the application, and mail it to the address provided. Upon approval, Amtrak will send the travel card to the address provided within four to six weeks. Other questions? Please call 800-USA-RAIL (800-872-7245).